Extension module for the TPC touchscreen controller. 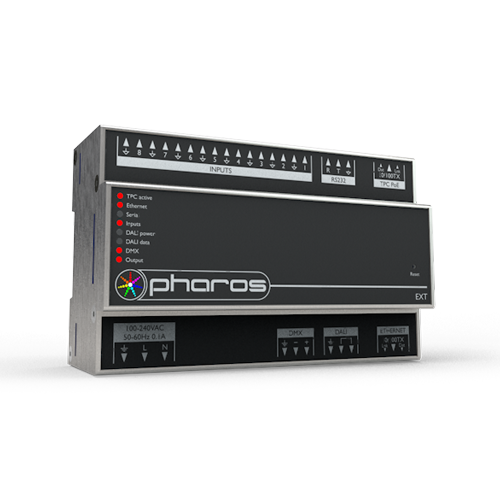 The Pharos EXT is an extension for the Pharos TPC and together they form a standalone, mains-powered lighting controller with versatile output and show control options. 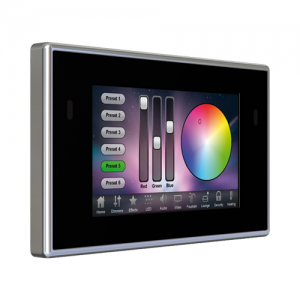 The TPC is a powerful lighting controller with Ethernet-based output and integration options. However, many DMX and DALI installations don’t need the added complexity of network infrastructure. The EXT provides local DMX and DALI output for the TPC, as well as power and other hardware interfaces. The EXT connects to its TPC via a Cat 5e or Cat 6 cable, which carries power and data. The EXT is powered from 100-240VAC mains. In addition to DMX output for the TPC’s 512 control channel capacity, the EXT supports a DALI bus connection to send & receive DALI control messages. Other interfaces are RS232 serial and 8 digital/analog inputs for triggering the TPC. The EXT also has its own Ethernet interface to allow some or all of the TPC’s control channels to be sent as eDMX. The EXT requires no additional configuration in the Pharos Designer software – everything is programmed via the TPC in the Designer project file, as if the TPC supported all the additional hardware interfaces directly. The EXT is provided in a compact DIN-rail compatible housing for mounting within an electrical cabinet, or alternatively it can be wall mounted. For easy installation most connections are provided as plug-strips. The solid state design with efficient, embedded firmware ensures unparalleled reliability.